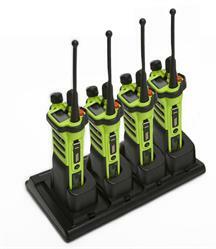 MIAMI, FL--(Marketwired - December 11, 2013) - AdvanceTec Industries expands its AdvanceLogic™ charger lineup with the release of the new Single and 4 Bay Drop-In Charger, designed for Motorola radios with IMPRES batteries (Li-Ion, Ni-Cd, Ni-MH)* as well as non IMPRES batteries. The Drop-In Charger is an advanced tri-chemistry conditioning charger designed to charge from the outer battery contact points. The 4 Bay Drop-in can charge up to four radios with batteries or the batteries alone, providing Negative Pulse Charging for IMPRES batteries and rapid charge for non IMPRES batteries. The unit automatically determines battery chemistry to provide accurate charging algorithm, and provides precise charge termination at 100% charge. It switches into maintenance mode after reaching 100% charge to keep batteries at peak condition, for as long as they remain on the charger. "The four stations and drop-in capabilities of this new radio charger can bring organization and efficiency to hectic environments," said Uli Ebert, Sales Manager at AdvanceTec – Solutions Division. "The convenience of use of the unit provides fleet departments across many industries not only a quick return, but a neater way to keep the radios charged up and ready to go continuously." 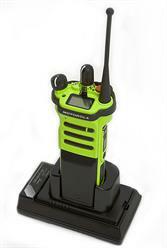 Custom adapter plates allow the user the convenience of charging different radios or batteries on the same charger. Made in USA. Established in 1987, AdvanceTec Industries is a global leader in the design and manufacturing of wireless communications devices and battery maintenance solutions. AdvanceTec's private label and OEM solutions are trusted by thousands of clients in telecommunications, public safety, emergency response services, military and government agencies, oil and gas companies, transportation, security agencies, and Fortune 500 companies. AdvanceTec's products have been proudly made in the USA for over 25 years. For further information, visit www.advancetec.com. AdvanceTec and AdvanceLogic are trademarks of AdvanceTec Industries, Inc. All other trademarks or service names are the property of their respective owners.